In my last article on detachment I explained that being detached means not having any expectations because you aren't attached emotionally to what happens next. Acceptance is the other side of detachment. Acceptance is the active or conscious part of being detached. This is the part that initially requires your active vigilance because by being detached you aren't always dealing with a contradiction. Sometimes, actually most of the time, you will be getting what you want. (Really, you are always getting what you want...) So instead of having to be detached from a contradictory outcome you must also be detached from a positive outcome. That sounds a bit odd and what does it actually mean? Expecting and accepting a desired outcome can be tricky because if you get used to things always going your way you could begin to expect it and then become attached to the outcome. In other words you become a bit spoiled and will find yourself thrown off track the next time you get contradicted. The trick to it is to remain detached while allowing yourself to have a preference but not a requirement or a need. You would prefer that it was a sunny day but rain is fine too. You wanted the parking space in front of Starbucks but the lot was full so you parked on the street. Each contradiction is a momentary blip with no emotional component to it, you just roll with it. I’d be willing to bet that more often than not you generally do get a good parking space every time you pull into Starbucks….. So what do you do when things are going your way? You know, when you are really in the zone and things are just flowing….? You accept it and smile to reaffirm your alignment with the outcome. In fact sometimes I break out laughing because the synchronicity is so overwhelming. So I laugh and give a silent thank you……..
We have to remember we are attracting our life to us at all times. Every single thing in our life is there because we have attracted it, consciously or unconsciously. 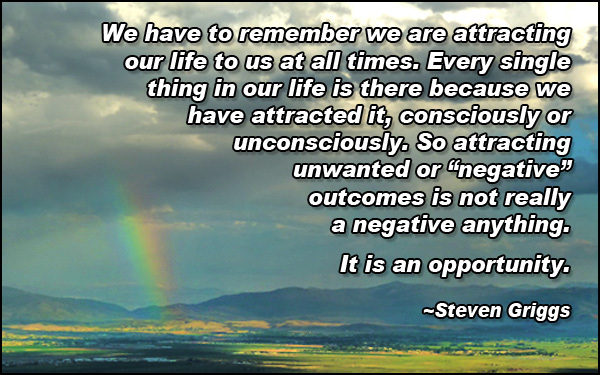 So attracting unwanted or “negative” outcomes is not really a negative anything. It is an opportunity. Be in alignment with your desired outcomes, remain detached from outcomes and understand that in time contradictions will disappear. In time as you become more and more in alignment, every outcome will be welcomed as an opportunity and will no longer be a contradiction. Acceptance won't even be on your mind, because what is, is.